Connecting Rod Kit with rod, big end pin, big end bearing, and thrust washers. This kit requires professional installation and some machine work. If you are going to use this in a CR125 from 1974, 1975, 1976, 1978 then you will need extensive crank work done to open the big end pin hole in the crank, rebalance and true the crank. 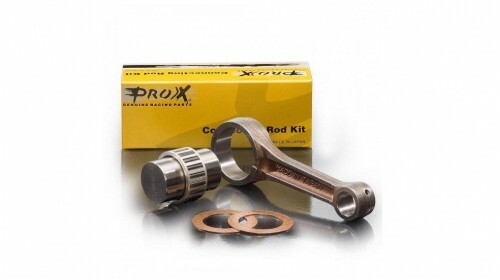 ProX Connecting Rod Kits are made out of the toughest alloys available today. O.E. specifications and tolerances are meticulously maintained, a guarantee for easy installation and trouble free performance.